Brick River Cider will never produce a pineapple cider. That’s not to say it wouldn’t sell; owner Russ John knows that it probably would. But he’d rather pour you a glass of the cidery’s take on a dry rosé wine – with a tart kick thanks to some Michigan Montmorency sour cherries – or the flagship Homestead, a cloudy, unfiltered farmhouse style reminiscent of the non-alcoholic fresh-pressed ciders you’d sip at the orchard as a kid. 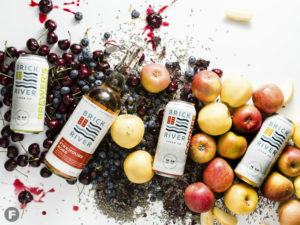 Unlike many large-scale cider companies that rely on rehydrated juice concentrate, Brick River exclusively uses fresh-pressed fruit, sourced from within 400 miles of St. Louis. But by limiting itself, Brick River has been forced to get creative and, in doing so, created a product that is a true taste of the region. In a city famed for its longstanding beer-brewing tradition, John seems poised to introduce St. Louis to a new cidermaking tradition. 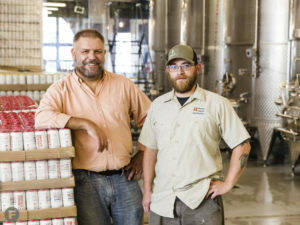 Although several local and regional breweries and wineries have released their own hard ciders over the years, Brick River is the city’s first dedicated cidery. Through a portfolio of innovative ciders, John aims to give consumers a nuanced taste of craft cider. John’s family has a long history with cider. In 1869, his great-grandfather Theodore Jahn, a former Union soldier who purchased a 160-acre homestead farm in southeast Nebraska. (He later changed his last name to John.) The family has continued to make fruit wines and ciders from those apple and pear orchards ever since – while searching through the barn around 15 years ago, John even found a few bottles of cider made by his grandfather during Prohibition. When John inherited the family farm about a decade ago, he considered a few possibilities, but kept being pulled back to cider. In February, he opened Brick River Cider Co. in St. Louis, featuring a 12,000-square-foot production facility and 180-seat tasting room and restaurant serving refined pub fare, in a former firehouse in Downtown St. Louis. The name is meant to honor the River City’s industrial history – St. Louis was once the biggest brick manufacturer in the country – but the cidery itself celebrates John’s long family traditions of farming and cidermaking. The rest of the apples – and all of the supplementary fruit and herbs used as flavorings in Brick River ciders – are sourced from presses and growers within 400 miles of St. Louis, including in southern Illinois, mid-Missouri, southeast Nebraska and southwest Michigan. It’s part of an effort to create a product that’s distinctly Midwestern – and why you won’t see any pineapple cider from Brick River. “We thought those kinds of limitations of working with whole fruit and working with regional growers were important enough to stay true to,” John says. lthough the mix of fresh-pressed apple juice is never exactly the same from year to year, any of Brick River’s ciders can be made from the same batch. It’s what happens in the cidermaking process, overseen by cidermaker Tom Johnson, that makes each cider unique. Of its four core offerings, Brick River’s two flagship – and best-selling – ciders are also its most traditional. Cornerstore is a classic, crystal-clear, off-dry and apple-forward style, while Homestead is a cloudy, unfiltered, semi-sweet farmhouse style. “It’s a nod to the way we did it out on the homestead, out on the plains, where you didn’t have a lot of technology and you drank it young,” John says of the latter. In general, American cidermakers don’t have access to the same unique “cider apples,” or bittersweet apples, used in the U.K. and France, which typically feature high levels of acid, tannin or sugar. These aren’t everyday table apples – if you bit into one, you’d probably spit it out – but they offer more complexity and richness when used to make cider. American cidermakers, on the other hand, have to get a little more creative in the cidermaking process by using different ingredients, fermentations and techniques. Enter Brick River’s two limited-edition ciders. In a nod to St. Louis’ longstanding brewing history, Brewer’s Choice is dry-hopped with Alsatian hops; the cider features herbal, grassy and earthy aromatics and drinks totally dry. Named for the former Engine House No. 32 that Brick River now calls home, Firehouse Rosé combines Michigan Montmorency sour cherries and a hibiscus tea blend for a tart take on a dry rosé. And last month, Brick River released its newest addition to the portfolio: a blueberry-lavender cider. The sweetest of Brick River’s ciders, it features a fresh lavender aroma and a bright blue-purple hue. As consumers begin to recognize that not all ciders are cloyingly sweet, John says there’s still a big misconception that the cidermaking process is similar to brewing; in fact, it more closely resembles winemaking. “You don’t cook anything [in cidermaking]; if you cooked apple juice, the pectins would solidify and you’d get apple jelly,” John says. Much like wine, cider is fermented from crushed and pressed fruit; at Brick River, it’s done so in stainless steel tanks. And unlike the beer-brewing process, there’s no boil, as cidermaking is done at cold temperatures. Many of Brick River’s ciders start their lives out the same way: The Cornerstone and Homestead, for instance, start with the same juice before being fermented across three different fermentations with three different ratios of yeast. Each fermentation imparts different characters to the cider: One might be more apple-forward, another might impart a little earthiness and yet another adds roundness and mouthfeel. The Cornerstone is also filtered and aged a little longer. The fermentations are blended in different ratios to create the two distinct ciders, and the Homestead is then back-sweetened with fresh apple juice at the end of the process to give it that straight-from-the-orchard flavor. Brick River uses wine yeast, which is inherently gluten-free, in all of its ciders. John and his team started by evaluating around 20 different yeasts before narrowing those down to three or four that the cidery works with predominantly. From apple to apple, the use of different yeasts can alter everything from the sweetness, astringency and viscosity to color, aroma and alcohol content. Each yeast gives off different attributes; some might be floral or herbal while others bring a citrus quality. “We had one we decided against because when you fermented apple juice with it, it tasted exactly like a sour apple Jolly Rancher,” John says. Johnson, an alum of Schlafly Beer and the now-shuttered Six Row Brewing Co., both in the St. Louis area, joined the Brick River team in late July after the departure of cidermaker Evan Hiatt. With seven years of industry experience under his belt, albeit a limited familiarity with cider, Johnson says he felt ready for a change. The opportunity to help grow St. Louis’ first cidery was just too good to pass up. Consumers clearly have a taste for Brick River’s unique ciders; in July, the company expanded distribution across eastern Missouri, including Columbia, St. Charles and Cape Girardeau, as well as in southern Illinois. Up until that point, its ciders were only sold in the St. Louis area, yet Brick River was still the fifth best-selling cider brand in the state behind national and international players like Angry Orchard, Strongbow and Crispin. In another year, John hopes Brick River sales will surpass some of those major brands. Now, thanks to St. Louis’ first dedicated cidery, that’s easier than ever. Brick River Cider Co. is St. Louis' first ciderworks.